Every December since I started this journal in 2002, I’ve been a part of Holidailies. This year, it runs from December 1, 2012 to January 1, 2013, and I’m doing it again. Will I post every day? That seems unlikely, given my lackadaisical approach to this journal in recent times, but I’m going to try. I’m sure I’d have a much better chance at success if I’d signed up with my nail blog, as I have a stronger recent history of posting regularly over there, but Holidailies is a Hat on Top tradition. I’m thinking some nail polish stuff will sneak in over here from time to time this month, as that’s the activity that’s been consuming the bulk of my hobby time, money, and effort lately. Other than that, we’ll just have to see what the month brings. 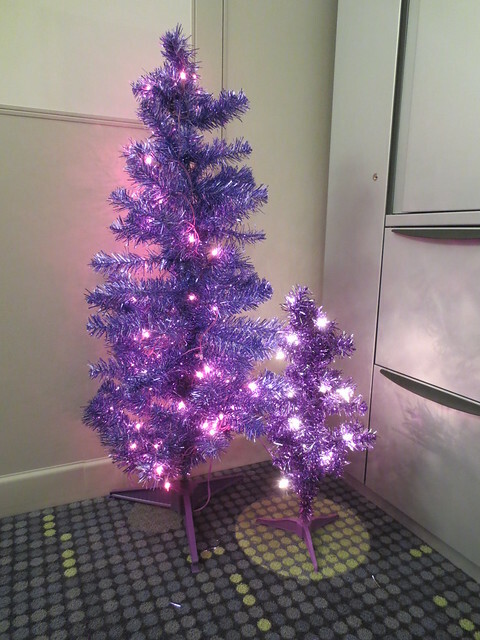 To get ready for the month, before I left the office last night I set up the purple Christmas tree I bought last year and its new friend, which I bought this year. Did I need another purple tree? No. I didn’t need the first one, either. But it improves my mood to have something pretty and fun to look at, and I think that boost is worth the price I paid for these (both on sale) and the space in my office cubby closet that the boxes take up the other eleven months of the year. On this date in 2011: No entry. Love the purple trees! Very pretty! Very festive. I have a tabletop white tree I’m decorating with blue pompoms.